In the last few months, a debate has been underway between New Urbanism and Landscape Urbanism, or more accurately between the former's Andrés Duany and the latter's Charles Waldheim, spurred by Waldheim's appointment as Chair of the Department of Landscape Architecture at Harvard University. (See a good synopsis of the debate and links to articles at Landscape+Urbanism.) New Urbanism is a popular reaction to sprawl in the United States that creates new towns and other large developments -- following the Congress for New Urbanism's (CNU) Charter -- with a higher density than suburbia, with mixed uses, with walkable neighborhoods, and with well defined civic spaces, all harking to a traditional pre-automobile communities. Landscape Urbanism, on the other hand is an academic movement with growing momentum that basically sees landscape and its processes as the glue of urbanism, and therefore it does not promote one type of physical construction (city, suburbia, etc.) over another. Duany is taking aim at Waldheim for purportedly embracing suburbia and sprawl, yet the latter will have the chance to clearly explain his position at CNU 19 in June; it is a debate that is far from being resolved. I'm bringing up this apparent fight for the future of urbanism here because Peter Calthorpe is one of the founders of CNU, but in his latest book he focuses on the region rather than individual communities or towns, expanding what he started with New Urbanism but also eschewing the partisan stances that lead to debates like these. 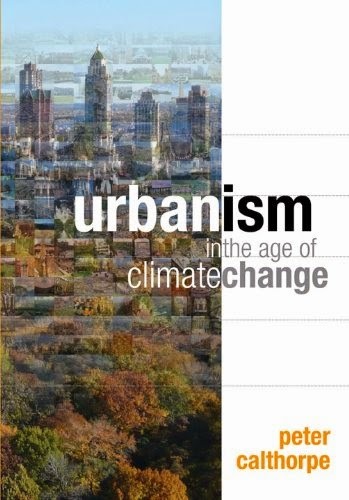 Calthorpe's argument for urbanism as an integral element for dealing with climate change does not abandon communities, but it situates them within the wider regional framework, evidenced by his firm's Vision California plan discussed in these pages. Theoretically this might situate him closer to Landscape Urbanism as a potential way of thinking and designing through the various transects defined by New Urbanism, but the latter is used as examples throughout the book. Yet Calthorpe's examples are not boosterism for CNU, so reading the book my attention was focused on his larger ideas. Basically Calthorpe's argument is that a single fix cannot reduce the effects of climate change. It's not renewable energy; it's not green building; it's not alternative fuel vehicles; it's not even sustainable development. But the last is his focus, what he sees as the least expensive fix to implement but the last in terms of the priorities of politicians, practitioners, and the public. Within his regional focus, sustainable development involves approaches like New Urbanism and Transit-Oriented Development (TODs), but considered on a larger scale. It is not enough to build a new "green" town, for example, it must be integrated with other cities in the region, as well as of course the landscape. Thorough data and references, accompanied by color plates that summarize the book's major points, help make Calthorpe's argument a hard one to ignore. Near the end of the book Calthorpe outlines four alternative futures, based on how urbanism changes (or doesn't) and how green technologies and other accompanying fixes advance. What path we should take is clear, even if the means of making it happen seem insurmountable.